There have been a number of accomplishments around AI and cognitive computing. How do these accomplishments translate into a real value proposition for businesses? Google has developed some awesome mobile applications that realize visual and audio recognition. Google just recently announced an open source Natural Language Understanding (NLU) system called SyntaxNet. This NLU system is built upon Google’s TensorFlow, an open source neural network framework. Google has been able to achieve an overall 90 percent accuracy rate with their system. This is quite an accomplishment from just ten years ago, where part of speech tagging consisted of simply identifying entity extraction (verbs, nouns, etc.). Having a system that understands natural language and all of the ambiguity that goes with it, especially in English, to achieve a 90 percent accuracy rate is impressive to say the least. However, this is not really AI or cognitive computing despite what the pundits write in the press. The ability to interpret user intent is a whole different ballgame that separates the cognitive computing from the statistical reasoning solutions. There have been a couple of companies that have shown impressive results with understanding user intent. Siri creators Dag Kittlaus and Adam Cheyer of Viv Labs, recently demonstrated an AI personal assistant called Viv. The engineers had ordered pizza using Viv personal assistant. Viv understood the engineer’s location and their pizza preferences, placing an order to the closest pizza store that could fill their order. This was done without doing a Google search, placing a single phone call or any typing at all, actually. Moreover, they did it without downloading an app. This is a remarkable feat in itself. Personal assistants are great for handling your personal affairs. What about solving complex enterprise problems, such as e-Discovery? Lymba Corporation has developed the ability to interrogate a contract through the use of natural language processing. Lymba’s contract analytic tool, using natural language inquiry, allows you to find clauses based upon concepts that are germane to contract administration. As an example (See Figure 1), “What clauses have time constraints?” The system will return all paragraphs that have statements about time constraints; not by keywords, but by concepts. 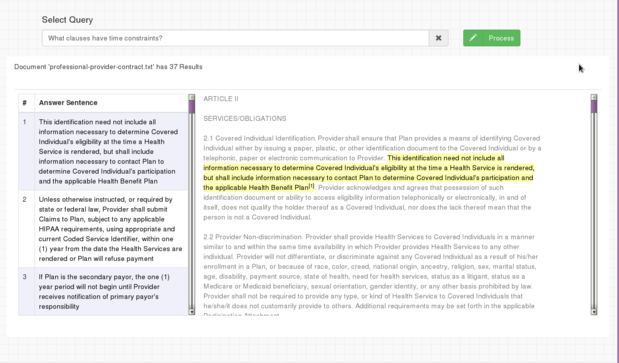 Currently this application can handle 25 different inquiries about contract concepts. A report from Deloitte in 2015 produced a list of other competitors, including: Luminoso, Alchemy API (which is now owned by IBM), Digital Reasoning, Highspot, Lumiata, Sentient Technologies, Enterra, IPSoft and Next IT to name a few. All of these companies are competing for cognitive computing type solutions. As a decision maker, how does one distinguish the value proposition of all of these technology companies? A big part of the problem is with editors writing misconstrued statements that make you believe that there are more capabilities than what actually can be realized. As an example one editor wrote: “So don’t expect Watson to be the only thinking machine option moving forward.” To infer that IBM Watson and other cognitive solutions mentioned in the Deloitte list are thinking machines is simply erroneous. IBM Watson is simply a statistical reasoning solution that does not interpret intent. In "Big data and machine learning – is the glass half empty?,” I point out that IBM Watson is a factoid solution and it can’t handle open-ended questions. In fact, Watson has problems clustering knowledge, performing co-referencing resolution and inferring new facts. These shortcomings become apparent when trying to answer list type questions. As an example “List the last three CEOs of JP Morgan Chase.” Watson might retrieve different paragraphs about the same CEO or CEOs outside the scope of the question. One last point, in one of IBM’s commercials, Watson is having a conversation with Bob Dylan. It is interesting that Watson identifies Dylan’s major themes of his songs as time passes and love fades. It is not surprising that Watson completely missed that Bob Dylan songs also dealt with civil rights and anti-war movement themes. As an example, in Dylan’s civil rights movement song, "The Times They Are a-Changin," there is no direct mention of civil rights or anything that can be directly linked to civil rights in his song. Unfortunately, even if Watson has a complete context of what’s going on in America at the time that song was written, it doesn’t possess the capability of co-referencing resolution to link the song lyrics to the civil rights movement. The only way that Watson would understand the context is if someone tagged the song with metadata. In order to tag the content with metadata, you would have to know the answers up front. So, where is the thinking in the cognitive computing solution? Building applications that understand concepts is a very powerful enabler for your business. However, building applications where the domain concepts are in a proprietary solution can be disastrous. It is paramount that a business develops an exit strategy to avoid vendor lock in. The best way to assure that you are mitigating your risk of vendor lock in is to employ cognitive solutions based upon open specifications. Think of the competitive advantage that you can gain by delivering smart applications that can learn of the business user’s intent, and yet are flexible enough not to lock you into a vendor’s proprietary solution. Now you have achieved a true value proposition that provides you with a competitive advantage that puts your line of business out of reach from your competition.